How will the vending machine market dynamics change with the adoption of aggressive growth strategies by pivotal industry magnates? The global vending machine market has lately been growing at a significant pace lately, characterized by an increase in the development of the energy-efficient solutions by producers that will assist companies in reducing their carbon footprint. Notable companies in this vertical are building eco-friendly as well as recycling vending machines for providing sustainable technologies to lower environmental impacts. Some of the major firms, including Coca-Cola, are apparently working on smart vending machines which are integrated with recycling technologies. Further, nations like the U.S., the UK, China and India have also adopted policies and initiatives to lower plastic usage, that would augment the growth of vending machine market. 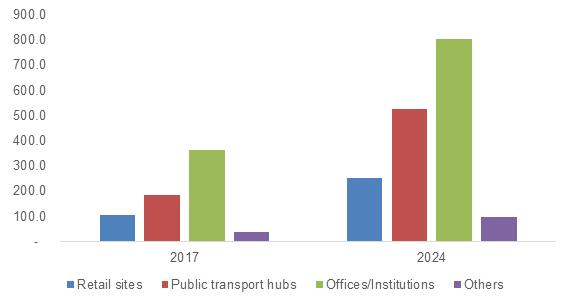 A rise in the application of smart dispensing solutions at public transport hubs like bus stands, railways stations, and airports is estimated to accelerate the growth of vending machine market. Transportation hubs are now focusing on transforming their operational techniques from manual to automatic. For example, the Indian Railways is heavily investing in automation and has installed an automatic food vending machine, operated using a tablet, in the Coimbatore-Bengaluru UDAY Express, in June 2018. Furthermore, the state-owned railway firm is planning to install similar systems in other trains in the future, which will drive the growth of vending machine market. In October 2018, Spain-based Azkoyen Group was bestowed with the ‘Innovation award’ for one of its beverage machines, at the Vending Industry Awards. Just a month later, the company increased its presence in the Asian continent by providing espresso coffee machines to the offices of the DBS bank and KPMG consultancy in Hong Kong (China). Earlier, Azkoyen Group had also installed its machines in the amusement parks of Vinpearl in Phu Quoc and Vinpearl in Nha Trang in Vietnam. Azkoyen is also known to have installed its machines in other significant outlets like supermarkets, national television VTV and the French embassy in Saigon, along with private universities BUV and RMIT, located in Hanoi, among others. The robust expansion strategy adopted by such leading companies will further propel the vending machine market trend in the upcoming years. Among some of the most tried-and-tested strategies, M&A continues to retain increased attention in the global vending machine market. Validating the same, in November 2018, the Troy-based Continental Services took another slice of the local food services market by acquiring United Vending & Market Services, a Ferndale-based food supplier. This acquisition, which was a part of the aggressive five-year growth plan of the company, was its fourth takeover in the past year. As the growth tactic of acquisitions continues to gain further traction, the global vending machine market will garner increased momentum in the forthcoming years. Leading manufacturer of professional coffee machines, the EVOCA Group, along with Mastercard in June 2018, launched a new payment app, Breasy, which would allow customers to buy coffee with their smartphones. Using Breasy, customers could pay through smartphones via a safe technology and have a completely digital and innovative shopping experience. The growing adoption of such sustainable technologies by numerous vending machine manufacturers will further accelerate the growth of vending machine market. The aforementioned instances aptly validate that the laudable efforts undertaken by prominent industry players would push the vending machine market trends in the coming years. The competitive spectrum of this industry is quite diverse, and consists of renowned companies like Sanden Holdings Corporation, Fuji Electric Co., Ltd., Crane Merchandising Systems, Inc, Bulk Vending Systems, Bianchi Industry SpA, Automated Merchandising Systems, and American Vending Machines, among others.